Despite its otherworldly name and appearance, Lunar Crater has decidedly earthly roots. More than three-quarters-of-a-mile wide and 430-feet deep, the giant crater was created by geological rather than extraterrestrial causes. Scientists who have studied the site believe a tremendous volcanic explosion created 400-acre Lunar Crater, which is located about 77 miles northeast of Tonopah via U.S. 6. The crater sits in a virtual nest of more than a dozen extinct volcanic cones and rock-hard lava flows that is known as the Lunar Crater Volcanic Field. Early Nye County miners and ranchers considered Lunar Crater an interesting novelty. In 1939, Nevada State Park officials erected a sign on the highway guiding visitors to the site. Later, it became an official U.S. Forest Service attraction. Part of the fascination of Lunar Crater is the fact that it is part of a much greater volcanic field. From its rim, it is possible to look around and see more than a dozen extinct volcanoes (many are not much more than dark mounds of rock). Additionally, Lunar Crater has a way of surprising. A visitor will cruise along the seven-mile dirt road leading from the highway to the site, craning his or her neck to see something that looks crater-ish and then, at the top of a small rise in the road, it’s suddenly there. The crater is big. From its upper edge, visitors look down into a huge, bowl-shaped valley that is difficult to visually measure because it is so large. Sitting on a wooden bench that overlooks Lunar Crater it is hard not to contemplate the tremendous power of Mother Nature—Lunar Crater was essentially formed by a giant burp in the earth’s crust. The crater is so massive that it seems to generate its own weather, including fierce winds that scream up its steep walls and blast anyone admiring the view. Lunar Crater does have a slight connection with outer space. In the 1960s, Apollo astronauts trained in the 140,000-acre volcanic field, which does look like a moonscape, in preparation for a lunar landing. More recently, scientists have tested remote sensing and other technologies for use on future Mars explorations. In addition to Lunar Crater, a secondary dirt road leads to nearby Easy Chair Crater, a collapsed cinder cone that gained its unusual name because, from a distance, it looks like a giant, overstuffed chair. Across the highway from the road leading to the two craters is the Black Rock Lava Flow, a more recent formation that covers about 1,900 acres. Visitors studying the dark basalt flow will see specks of green, red, and black glass, which formed because the lava cooled so quickly. The dirt road leading to Lunar Crater is extremely wash-boarded and a high-clearance, four-wheel drive vehicle is recommended. Lunar Crater is located about 270 miles southeast of Carson City via U.S. 50, U.S. 95 (to Tonopah) and U.S. 6. 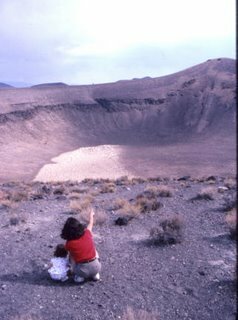 For more information about Lunar Crater, contact the Bureau of Land Management, Tonopah Field Station, 1553 South Main St., P.O. Box 911, Tonopah, NV 89049, 775-482-7800, www.nv.blm.gov. With unobstructed views of Slide Mountain and the surrounding Washoe Valley, Washoe Lake State Park is one of the best places to experience Northern Nevada’s basin and range environment. On warm days, the lake, which is about four miles long and two miles wide, becomes a haven for water sports enthusiasts. Windsurfing is extremely popular at Washoe Lake as well as Little Washoe Lake, a smaller, sister body of water to the north that is part of the park. Windsurfers find that due the strong winds that whip down from the mountains to the west provide excellent conditions for riding the lake’s waves. High above Washoe Lake is Slide Mountain. The native Paiutes called it a name that roughly translates as “mountain that falls down on itself.” About once every century—the last time was in 1983—Slide Mountain releases a wave of mud and rocks. In fact, in the mid-19th century, humorist Mark Twain wrote about a fictitious legal battle between two ranchers—one wanted his house returned to him after a slide had deposited it on top of his neighbor’s dwelling. From the park, the 9,600-foot mountain is a beautiful sight with its pine-covered slopes and distinctive half-face topped with snow. Human settlement at the lake can be traced to migrant bands of native Washo Indians, who often spent winters in the lowlands of the valley and summers at Lake Tahoe. Many used the willows and cattails from Washoe Lake marshes to make baskets and other items. In 1859—the same year that silver was discovered in nearby Virginia City—Mormon settlers established a community at Franktown on the west side of the valley. Within a short time, two mills opened in the valley to process the ore and the towns of Washoe City, Ophir, and Lakeview had come into existence to supply the mines. In the 1870s, the Virginia & Truckee Railroad, which extended from Reno to Virginia City, was built through the area and provided a means for transporting goods to and from Washoe Valley. Washoe State Park was created in 1977 to preserve the valley’s unique natural assets and provide a place for water sport enthusiasts. The park encompasses 8,053 acres and sits at an elevation of about 5,000 feet. 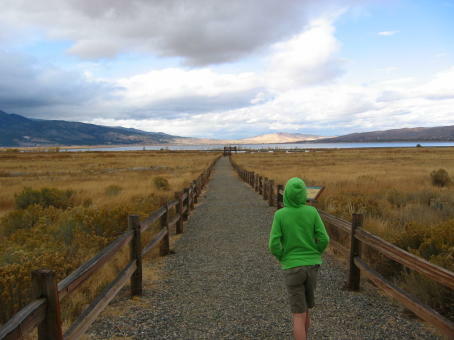 At the Main Area Campground in the center of the park (accessed from Lake Boulevard), Washoe Lake State Park has 49 campsites available on a first-come, first-serve basis. There is also an RV dump station, boat ramps, flush toilets, showers, drinking water, hiking trails, and picnic tables. The park can accommodate tents or self-contained RVs (up to 45 feet in length) and has 10 RV pull-throughs. There are, however, no hookups for the RVs. A one-third mile trail from the Main Area Campground winds through sand dunes and leads to the lake. Smaller, undeveloped trails lead around the lake. A recent addition to the park is a wooden viewing platform and interpretive displays adjacent to the wetlands at the south edge of the park. The viewing area offers a wonderful overview of the lake and magnificent views of Slide Mountain and the other mountains encircling the valley. You’ll also find a coin-operated telescope on the platform, which allows you to scan the marsh looking for wildlife. The displays point out that the marsh at the south end of the lake is popular with a variety of waterfowl, which you can occasionally spot, including cranes and herons. Washoe Lake State Park is located 10 miles north of Carson City and 15 miles south of Reno via U.S. 395 north and the East Lake Boulevard exit. It is open all year. Admission to the park is $3 per person; $11 per night for a campsite. For park information, call 775-687-4319. It should probably come as no surprise that in a state built by dreamers—in the early days it was miners and more recently, gamblers—some amazing and outrageous proposals have cropped up over the years. 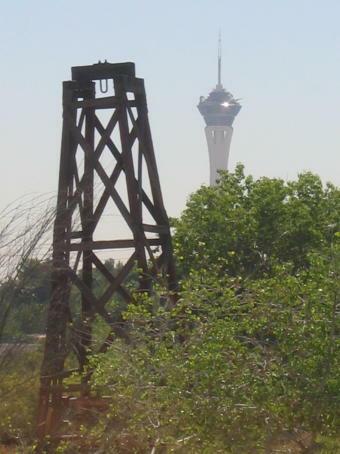 Some, like Adolph Sutro’s dream of building a four-mile-long tunnel underneath Virginia City to drain hot water from its mines or the 1,149-foot Stratosphere Tower in Las Vegas, were actually constructed. Others, however, proved to be more illusory. For instance, in the early 20th century, the president of the Lake Tahoe and San Francisco Water Works, A.W. Von Schmidt, suggested constructing a massive pipeline from Lake Tahoe could solve San Francisco’s water woes. Author David W. Toll writes that Von Schmidt’s $17 million plan would deliver thirty million gallons of Tahoe water per day—and he was even willing to deliver as much as a hundred million gallons per day for the right price. Apparently, the idea had sufficient legs that the San Francisco Board of Supervisors visited the proposed site of his diversion dam on the Truckee River before letting the proposal fade away. Tahoe’s water, however, cast a strong spell on San Francisco. Toll notes that three years later a San Francisco attorney named Waymire wanted to drill a tunnel through the side of the Tahoe Basin to drain lake water into the Rubicon branch of the American River, which would be routed to the city. Of course, the idea of draining Lake Tahoe wasn’t purely a Golden State notion. Sometime in the 19th century, there was a proposal to drill a tunnel from Washoe Valley to a point deep below Lake Tahoe so that water could be diverted to Virginia City and other parts of Northern Nevada. More recently, many of the more noteworthy flights of developmental fancy have involved various hotel-casino related projects that never reached fruition. 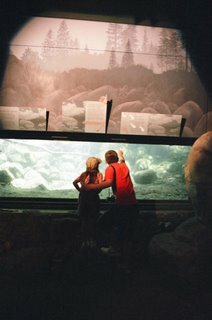 In the 1960s, Reno resort owner William Harrah purchased a huge tract of land along Interstate 80 near Verdi and began planning to build a giant, indoor theme park. The project, known as Harrah’s World, called for a massive dome over the park, so that it could be used year-round, and included acres of museum space for his famous car collection as well as amusement park rides, a train and, of course, a hotel-casino. Harrah died before he could begin construction and the project was abandoned. In rural Nevada, perhaps the most ambitious resort development was an effort in the 1980s to restore the historic Goldfield Hotel, which opened in 1908. A San Francisco developer spent millions to renovate the structure that had been abandoned since about the 1960s. He also bought up other historic structures in the community, including the Goldfield High School, and announced plans to transform Goldfield into a kind of 19th century mining town version of Williamsburg, with residents dressed in period costumes. Sadly, his vision proved bigger than his checkbook and, after sinking a considerable amount of money into the project, he ran short of funds. A couple of years later, the hotel was auctioned by the county for unpaid back taxes. A rural project that never made it past the blueprint stage was a plan in the early 1990s to construct a Science and Technology Museum in Nye County, near Amargosa. The idea was to take money that the federal government was going to give to the county in exchange for building a national nuclear waste dump and sink it into a large science museum in the desert. A scale model was produced of the project—I know because I saw it—but the funding never materialized and it was never built. One of the most controversial projects that never happened was the MX Missile system, an ambitious proposal to construct hundreds of miles of subterranean railroad tracks throughout Central Nevada. Missile launchers on trains would scurry around on the tracks, never staying in one place too long. In the event of a confrontation between the U.S. and Russia, the missiles could be routed to convenient launching sites and fired. Fortunately, the Cold War began to thaw before it could be built. Not surprisingly, Las Vegas has had its share of unorthodox proposals. In the early 1990s, Las Vegas officials were searching for ways to boost the fortunes of the city’s aging downtown core. One of the more creative solutions came from several downtown casino owners who proposed replacing downtown streets with a series of water canals. Boat rides on “Las Venice,” as some called it, would attract tourists and the canals would be lined with trendy shops and restaurants, in addition to the hotel-casinos. Water for the canals would come from a layer of unused but polluted water that sits underneath the downtown. The concept called for the water to be cleaned up and recycled for use in the canals. Schumacher said another plan under consideration at the time was to construct downtown a full-size replica of the Starship Enterprise from the “Star Trek” TV show. The vessel would be 23 stories high and 600 feet long and would include a thrill ride, restaurants and convention facilities. Over the years, there have been a number of unusual Las Vegas resort concepts that never were constructed. In the 1990s, casino owner Bob Stupak, who built the Stratosphere, announced he was going to erect a hotel that would be a full-size replica of the Titanic that would sink nightly. More recently, a Las Vegas Strip mall announced it was going to build a 22,000 square foot fake Grand Canyon. This faux natural wonder would have theatrical special effects like flash floods and thunderstorms, and visitors could take a ride on a simulated helicopter over the canyon. But, like so many of these other grand schemes, it dispersed into the fog of ideas whose time never quite came. 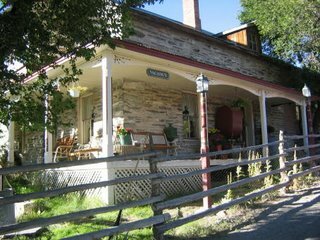 If there was ever a place where you could believe that you’ve managed to escape from the hassles and pressures of daily life, it’s the rustic Belmont Inn in the historic Central Nevada mining town of Belmont. Located about 40 miles northeast of Tonopah, Belmont can trace its beginnings to the discovery of silver in 1865. Within a few years, the town has grown to include about 5,000 residents. 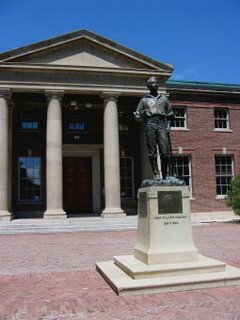 In 1867, Belmont was designated the seat of Nye County and a few years later, in 1876, it constructed an impressive a two-story Italianate-style brick courthouse. During Belmont’s heyday—which lasted from the late 1860s to about the late 1870s—the town was a beehive of building activity, boasting a bank, a couple of churches, a school, a post office, several stores and saloons. It was during this period, in about 1866, that the distinctive two-story structure that houses the Belmont Inn was constructed. Built of wood and local limestone, the Inn originally served as the offices of the Combination Silver Mining Company. The building was converted to a private residence several decades ago and, more recently, transformed into a bed and breakfast with five guestrooms. The Inn, operated by Henry and Bertie Berg, is a wonder. It’s been lovingly restored so that guests can enjoy quiet, comfortable quarters in a quaint, historic setting. Behind the main house, the Berg’s have rebuilt an old stone miner’s cabin and offer it as a kind of “honeymoon” cottage that offers plenty of privacy, although without running water or electricity. However, candles have been strategically placed around the room to provide illumination. Large groups more interested in “roughing it,” can rent an old bunkhouse behind the main house, which has accommodations for up to ten additional guests. The guestrooms, however, are only part of the story. The Belmont Inn also has its own, old-time saloon—Henry Berg is a great bartender who knows not only how to pour a good stiff one but lots of great anecdotes and stories about the area. Not to be overlooked are the breakfasts, cooked by Bertie Berg. She prepares hearty, tasty fare that can include pancakes, sausage, biscuits, fruit and other delicacies. The charm of spending time in Belmont is having a chance to explore the old mining town. The town’s silver mines began to slump after 1876. By 1890, only about 150 people remained in the town. Jim Butler’s discovery of huge silver deposits in Tonopah in 1900 accelerated Belmont’s demise. 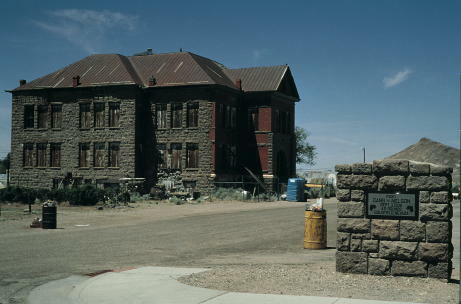 In 1905, the county seat was moved to Tonopah and Belmont’s fine courthouse, which is now a historic state park, was closed. Despite the years of neglect, it’s still possible to find glimpses of the settlement that once rivaled Virginia City. With more than a dozen buildings sprouting out of the sagebrush and a number of substantial ruins, Belmont looks and feels like a genuine ghost town. For instance, at the south end of town is the Belmont Cemetery, which contains a handful of hand-carved wooden markers and is the final resting place of the infamous Nevada gunslinger Jack Longstreet and his wife. The Belmont-Monitor Mill, located north of the cemetery, was one of several mills erected in the area in the 1870s. The site’s extensive brick ruins include a 15-foot brick smokestack. East of the Belmont-Monitor Mill site is the main part of the town. Newer homes have been built around the ruins during the past couple of years. The main street, which leads to the Belmont Inn, is lined with a picturesque row of dilapidated brick and wooden storefronts. Behind this row of structures is a dirt road leading to the Belmont Courthouse, which has been stabilized by the state parks. Guided tours of the courthouse are offered during the summer. Southeast of the Belmont Inn are other ruins, including the remains of a massive brick kiln with a 20-foot smokestack. About a quarter mile west of the brick oven, is the site of the former Highbridge Mill. The two-story building retains its large, nine-window brick façade. 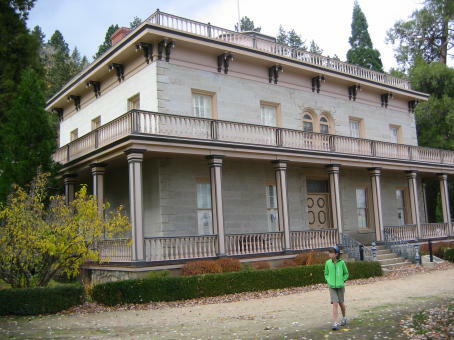 While exploring Belmont is encouraged, visitors are cautioned not to touch or take anything so that the town can be preserved for future generations. For more information about Belmont and the Belmont Inn, call 775-482-2000 or go to www.belmontinn.com. Some folks look at Nevada’s wide, open expanses and see nothing. Those in the know look at the same landscape and see it for what it is—a biological wonderland filled with unique plants, fish, and animal life. One of the best places in Nevada to discover the desert’s hidden life forms is Ash Meadows Wildlife Refuge, located in southwestern Nevada, about 90 miles north of Las Vegas. The first thing you notice about Ash Meadows is that it doesn’t look much different from the rest of Southern Nevada. You see acres of gently rolling hills, occasionally populated by sagebrush, juniper trees, and mesquite bushes. But upon closer look you’ll find there’s much more to Ash Meadows. In fact, this little pocket of rural Nevada boasts the greatest concentration of endemic species in the United States. Some 24 different species of plants, fish, and animal life are only found at Ash Meadows. The Ash Meadows refuge, which encompasses about 22,000 acres, was originally part of a large Amargosa Valley alfalfa ranch, which was later used for cattle ranching. In 1984, the nature conservancy purchased a portion of the ranch to prevent it from being further developed. A few years later, the area was designated a national wildlife refuge and came under the management of the U.S. Fish and Wildlife Service. 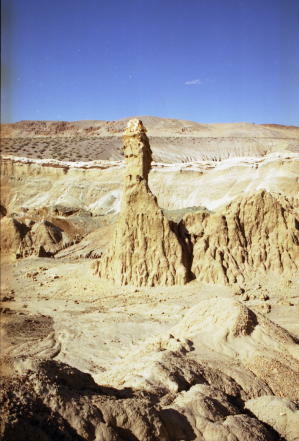 In 1994, a small part of the wildlife refuge, the site of a natural area known as Devil’s Hole, was made part of the Death Valley National Park. One of the main reasons that Ash Meadows was made into a nature preserve was because of the presence of a tiny creature known as the Devil’s Hole pupfish. This inch-long, nearly transparent fish can only be found at Devil’s Hole, which is a deep, narrow crevice in the ground that is filled with natural spring water. This small body of water is the only place in the world that the devil’s hole pupfish proliferates. About 90 percent of this endangered species lives within 20 feet of the water’s surface and spawn on a submerged rock ledge. 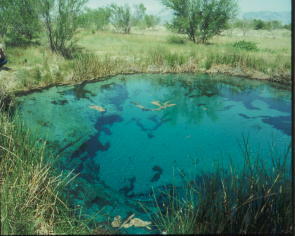 Ground water usage in the surrounding Amargosa Valley is strictly regulated to ensure that the water level in Devil’s Hole doesn’t drop below the level necessary to support the pupfish population. Scientists believe the springs throughout the valley are linked so that any change in the water table, such as that caused by excessive groundwater pumping, can have an adverse effect on the pupfish. The Devil’s Hole pupfish isn’t the only unique species of fish found at Ash Meadows. On the refuge you can find about a half-dozen spring-fed pools, and nearly each has its own one-of-a-kind species. For example, the Ash Meadows Amargosa Pupfish thrives in a warm water pond called crystal springs while the Warm Springs Pupfish is only found in a pond known, not surprisingly, as Warm Springs. Additionally, at Jackrabbit Spring, you’ll spot the endangered Ash Meadows speckled dace, another type of tiny fish. Each pool is believed to have once been part of a larger body of water that eventually receded into smaller, separate ponds. Over time, subgroups of pupfish evolved, each genetically different from the others. Walking through the refuge is a peaceful experience. A few hundred yards from the dirt road leading into the refuge, it’s not uncommon to spot small herds of wild horses and wild burros foraging in the area. A short walk from the main parking area leads you to crystal spring interpretive boardwalk. This wooden walkway allows you to safely view some of the unique plants found at Ash Meadows, such as the threatened Ash Meadows Ivesia and the Ash Meadows Gumplant. The boardwalk also provides a platform for viewing crystal spring, which is so-named because of its sparkling, inviting, clear blue waters. Standing on the grassy edge of the warm, spring-fed pond, which is about the size of a typical backyard swimming pool, you can see small bubbles rising from somewhere below. It you look closely into the water, which is about 85 degrees, you can see the tiny pupfish swimming around a submerged rock ledge, looking like tiny, silvery, nearly see-through sardines. It is kind of humbling to look at these little fish darting through the water and realize that they represent all the members of their particular species in the entire world. Ash Meadows is home to seven species of plants that are either endangered or threatened, including the Amargosa niterwort, the Ash Meadows milk-vetch, and the Ash Meadows sunray. The Ash Meadows naucorid, a water-based beetle, is also on the list of threatened insects. 239 different species of birds have been sited at the refuge, including endangered falcons and bald eagles, which makes it popular for bird watching the best time of year to spot birds is during the spring and fall migrations. Among the remnants of the old cattle ranch that was once on the site of the refuge are two large, manmade lakes, fed by overflow from some of the springs. At one of them, Crystal Lake, swimming is allowed. The long-term goal of the wildlife service is to remove any unnecessary roads and buildings as well as the more than 100 non-native plants and animals that were introduced into the region by past development. For more information about the Ash Meadows National Wildlife Refuge, call 775-372-5435. Years ago, a friend told me about a nice, little scenic road that passed through the heart of the Santa Rosa Mountains in Northern Nevada. After driving the route, known as the Hinkey Summit Drive, I can say he undersold the road. Hinkey Summit Road is one of the most spectacular drives in the state. It begins just beyond the quaint and picturesque community of Paradise Valley, on the eastern side of the Santa Rosa Range, about 45 miles north of Winnemucca. The first few miles of the drive are not particularly noteworthy. You drive on a graded gravel-dirt road through a flat, dry high desert valley. Soon, however, you start to climb into the range via a fairly winding route. The terrain gradually changes from piñon and sagebrush to rolling hills covered with wildflowers (and, of course, more sagebrush). While it’s best to have a high clearance, four-wheel drive vehicle, the road isn’t particularly rough or difficult, just a bit bumpy. Along the way, you pass a handful of small cabins and homes tucked into little side canyons. These are private residences, most used during the summer months. A mile or so up the road, you begin to see a couple of the range’s impressive granite peaks. Just ahead is a craggy, rock mound, its rough, gray surface resembling elephant skin. Soon, we spotted one of the most remarkable sights on the drive—a mountain slope thickly covered with blooming, yellow mule ear flowers. This combination of vivid green, gray and yellow colors seemed painted on the landscape. The road continues to climb and the mountain peaks grow even more scenic. To one side, we viewed a virtual wall of jagged mountaintops, some still covered with small patches of white snow. We stopped here to enjoy the view, delighting in the unspoiled beauty of these mountains. To the west, we could see Granite Peak, one of the taller peaks in the range with an elevation of 9,732 feet. 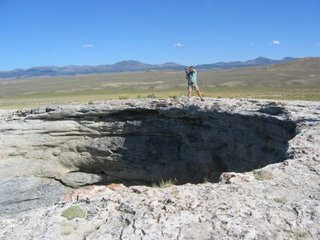 A bit farther, at Hinkey Summit, we came upon one of the most amazing geological features of the drive—a large, round hole in one of the mountains. Measuring perhaps 30 to 50 feet across, the hole, which apparently has no name, is angled slightly so that when you stand below it you look up into the deep blue sky. We stopped to explore the hole; my teenage son climbed to a rock ledge at its base so I could take his photo. The rocks and the opening, which is almost a perfect circle, are fractured in such a way as to resemble a large stone bulls-eye. Opposite the hole in the mountain are a handful of buildings, which are the Martin Creek Guard Station. A bit up the road from the guard station is the Lye Creek Campground, which has 13 developed campsites and a large group picnic area. 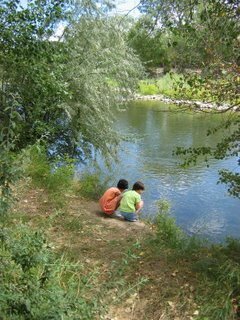 Several spring-fed creeks can be found running through the campground, which is generally open June through October. From here, the road slowly begins to wind down the western slope of the range. A few miles from Hinkey Summit you reach a series of narrow, sharp switchbacks known as Windy Gap. When you finally reach the base of the gap, the road flattens out and continues west to U.S. 95. Along the way, you will pass the ruins of an abandoned mining mill site, which appears to date to the mid-20th century. It’s a fairly quick drive to the highway, which leads south to Winnemucca or north to McDermitt and the Oregon border. The Hinkey Summit Drive offers a unique opportunity to travel through the remote and uncrowded Santa Rosa Mountains, among Nevada’s less well-known natural treasures. For more information about the area, contact the Santa Rosa Ranger District, 1200 Winnemucca Blvd. East, Winnemucca, NV 89445, 775-623-5025, ext. 24, www.fs.fed.us/htnf/santarosawelcome.htm. For years, I’ve wanted to see the geological oddity known as Diana’s Punchbowl; also known at the Devil’s Punchbowl or the Devil’s Cauldron. I’d looked at photos depicting this wide, deep hole filled with scalding hot water and wanted to see if for myself. Recently, I got my wish. While traveling through Central Nevada with the Wild Nevada TV show, I noticed that our planned route through the Monitor Valley would take us by Diana’s Punchbowl. After a bit of cajoling, the crew agreed to check out this geothermal phenomenon that had so gripped my imagination. As we traveled along a dusty, unpaved road in the center of the valley, we could see the distinctive site from many miles away. Diana’s Punchbowl is located atop a massive travertine hill that is quite noticeable because it is nearly white. We turned onto the road leading to the mound, which measures about 600 feet in diameter, stopping at the base of the rise. We parked and began the short climb to the top. Then, there it was—Diana’s Punchbowl. The bowl is actually a big hole in the top of the hill. The opening measures about 50 feet across. Inside are steep, nearly vertical walls that drop down about 30 feet to a small geothermal pool filled with water that is said to be 200-degrees (Fahrenheit) hot and reportedly exhales hot vapors and gases as well as steam. As I cautious crept closer to the edge, I could see there is a small, grass-covered ledge inside of the bowl. Amazingly, some irresponsible and stupid souls have somehow climbed inside of the bowl and left graffiti markings on the interior walls. As I stood at the top, looking down into the blue-green waters, I was impressed by the size and appearance of this geological marvel. It had been worth the effort to get there. While it’s difficult to find much written about Diana’s Punchbowl, it appears to have been created when the top and center core of this limestone hill collapsed, leaving behind the large, water-filled opening. The origins of the punchbowl’s name vary. Helen Carlson’s “Nevada Place Names” book implies that the name came from Diana, the Roman goddess of springs and brooks. According to Phillip I. Earl, former curator of history at the Nevada Historical Society, the site has been known to native peoples in the region for thousands of years and to local ranchers since their arrival in the 1860s. Earl has written that the Native Americans viewed the punchbowl as the home of great spirits, lost souls, and mysterious creatures. He noted that one particularly common story surrounds the tossing of an unfaithful husband into the steaming, hot bowl by his unhappy wife—although there’s also a version of the story that has a jealous husband dropping his wife (named Diana) into the hot water after suspecting her of infidelity. According to Earl, the first tourists to visit the site were probably local folks from nearby Belmont, Austin or Tonopah, who would picnic on the mound’s slopes and enjoy the views. Earl has also written that a bottle thrown into the bowl’s hot waters will break as it touches the surface—but please don’t try it because littering is against the law. In the end, the best thing about Diana’s Punchbowl is that it exists. It’s one of those unusual Nevada places that help to define what makes the state so special. And I’m glad I finally got to see it. Diana’s Punchbowl is located about 35 miles south of U.S. 50 via a dirt road that is 13 miles east of the Hickison Summit Rest Stop. For more information go to www.bigsmokyvalley.com/places_to_see_sv.htm. While the name is perhaps a bit of hyperbole, the site is noteworthy for being one of those hidden, largely unknown scenic gems that occasionally can be found in remote parts of the state. In this case, the Miniature Grand Canyon is located high in the Monitor Range on the east side of the Monitor Valley in Central Nevada. I discovered the Miniature Grand Canyon last year while researching potential trips for Reno public TV’s “Wild Nevada” program. The show’s former producer, Jack Kelly, and I were studying maps of the Monitor Valley and spotted the intriguing name on an atlas map. We checked around to see if anyone had ever been there and discovered from a National Forest Service staffer that it was, indeed, a real place. Our informant, who had been there, said it was quite lovely but small, hence the name. So, we headed out to the wilds of remote Central Nevada to find this lilliputian landmark. To reach the Monitor Valley, we headed east on U.S. 50 to Austin (about 171 miles from Carson City), then continued east for another 35 miles to a dirt road on the south side of the highway. We turned onto the dirt road, which is in fairly good shape, and continued south through the center of the Monitor Valley. After driving for about an hour and half, we turned onto a road heading east and climbed into the Monitor Range to find the Miniature Grand Canyon. Since there aren’t any road signs indicating exactly how to reach the canyon, consult a good road atlas such as the Nevada Road & Recreation Atlas by Benchmark Maps. The road wound through juniper and piñon forests before finally reaching the site. Coming from the west, we encountered a wide, fairly steep box canyon that opened up adjacent to the road. A small wooden sign indicated that it was the Miniature Grand Canyon. While this spot was pretty, it only served as an appetizer for what was below. We decided to climb down the hillside, below the sign, and entered the canyon from the west side. This involved wandering through clumps of juniper trees, then crossing a couple of expanses of loose, shale-like rock to reach the canyon opening. A small creek ran from the canyon mouth, so we followed it through thick underbrush for a couple of hundred yards before encountering the truly best part of the canyon. Here, the canyon narrowed into a small (only about a 100-feet wide) opening with steep vertical walls of perhaps 50-feet. The creek trickled from above, and we could see that when it had more water (in the Spring or early summer) it fell over two or three rock benches, which created a small series of waterfalls. Inside this opening in the canyon’s moist rock walls, there were patches of lush vegetation. The result was that the place seemed like a tiny Garden of Eden, with its green grasses, mosses and shrubs growing amidst the trickling waterfalls. After making this discovery, we wondered what it looked like from above, so we returned to the road, and then hiked to the spot from above. From there, we could see that over many, many centuries the small creek had carved a steep channel through the rock walls, including the opening at the mouth of the canyon. The process, in fact, had been similar to the way in which the real Grand Canyon had been formed. So, it really was a Miniature Grand Canyon. And without the crowds. Years ago, a woman from Goldfield told me about a place in central Nevada that she said deserved to be a state park. She described it a geological wonderland with stumps of petrified wood, beautiful eroded cliffs and unusual clay spires and other formations. She called this place the “Sump.” Since my dictionary defines a sump as a pit, cistern, or cesspool for draining liquid—I didn’t exactly rush out to find it. The Sump is one of those hidden treasures you occasionally stumble upon when exploring Nevada. It doesn’t show up on many maps (it’s not on the official state highway map) and it’s not mentioned in any of the major Nevada guidebooks. In fact, the best directions for reaching the Sump appear in a recently published rock-hunting guide, “Rockhounding Nevada,” by William A. Kappele (Falcon Publishing, 1998). But despite its obscurity, the Sump is worthy of a visit should you find yourself traveling on U.S. 95 between Hawthorne and Tonopah. Keep in mind, however, that you’ll need a high clearance vehicle, preferably with four-wheel drive, to make this trip. To reach it, head south of Hawthorne on U.S. 95 to the Coaldale Junction. Drive west on U.S. 6 for about six miles, then turn south on State Route 773. Continue 10 miles before turning left on a dirt road (if you reach the intersection of 773 and State Route 264, you’ve gone about four-tenths of a mile too far). Head about a half-mile to a wide wash, then carefully drive into the wash (there is a steep drop), which can be sandy in places. Turn left and continue about 1.5 miles to the lower end of the Sump. From this spot, you can walk into the Sump and begin exploring this bizarre, otherworldly landscape. Geologically speaking, the Sump began to form about 25 million years ago. At that time, a vast, prehistoric body of water named Lake Esmeralda covered the region. Over time, sediment was carried into the lake by streams and creeks. This mud eventually hardened into multi-colored layers. Later, the area experienced volcanic activity and the sediment became covered with volcanic ash. Intense geologic forces uplifted the region, creating the current mountain ranges near the Sump (the Volcanic Hills and the Silver Peak Range). During the last two million years, additional volcanic eruptions further shaped the landscape with basalt flows and pumice eruptions. In the last couple dozen millennia, the main influence on the Sump has been erosion. The wind, snow, and rain have carved the sedimentary rock into tall twisted columns, smooth mounds, and rippled, curtain-like rock walls. Wandering its mile-and-a-half length, I found myself comparing it favorably to Cathedral Gorge State Park in Eastern Nevada. Additionally, the Sump contains the remnants of a grove of petrified trees. In most cases, these tree stumps stand on mounds of solidified mud, surrounded by tens of thousands of brown chips (from a distance the mounds actually look like piles of wood chips). Apparently, these smooth brown rock chips are examples of incomplete petrified wood; the cellular replacement of the wood with silica (the process of creating petrified wood) was not completed. As a result, the Sump’s petrified wood doesn’t have the grain texture or hardness usually associated with the better examples of petrified wood. Deeper into the wash, near the northeast end of the Sump, you can also find white petrified wood twigs and casts littered around the ground. While small, they are interesting, nonetheless, because you can actually see the wood grain in the rock fragments. Exploring the rest of the gorge, you can find plenty of other types of rocks. Not being a rock hound or a geologist, I wasn’t certain what we were finding but did see some nice red rocks (perhaps jasper?) as well as beautiful greenish stones (copper?) and plenty of small white and rose quartz pieces. But interesting rocks aside, the best thing about the Sump is its mood and ambience. Climbing around its bizarre rock mounds and formations, scanning a landscape that has remained so unchanged by man, it’s easy to believe you’re the first person to ever see the place. Until you notice the old ATV tracks in the center of the wash. While I’ve been fortunate enough to have traveled a good deal of the state of Nevada during the past couple of decades, there are still plenty of places I’ve never had the pleasure of visiting such as Toquima Cave. 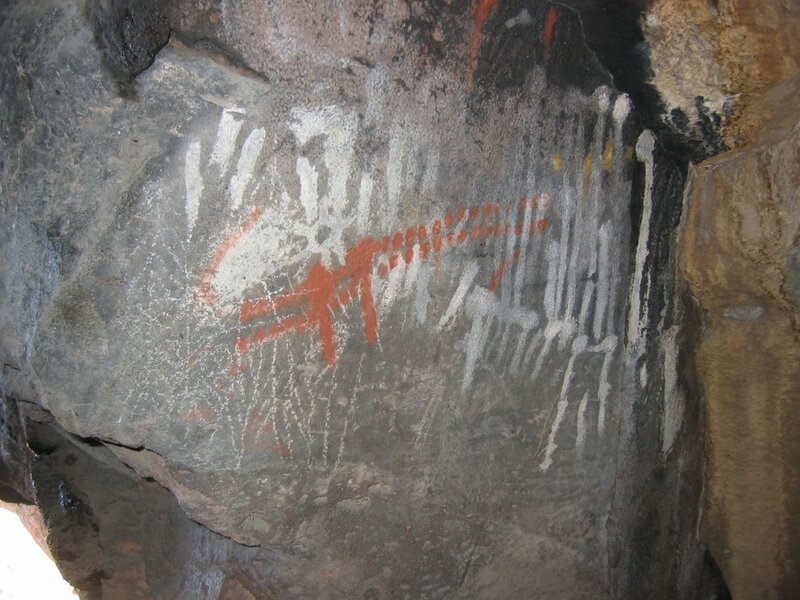 Located in Central Nevada, Toquima Cave is an archaeologically significant site that contains prehistoric pictographs, which are painted symbols, designs and patterns. Pictographs are similar to petroglyphs, which have been carved into rock rather than painted. Archaeologists aren’t quite sure how to interpret either of them but it is generally believed that Native American people, who may have been the ancestors to today’s Nevada tribes, created the drawings and carvings. Part of the reason I’d never made it Toquima Cave is that it’s located in a fairly remote part of the state. It sits high in the north section of the Toquima Range and is accessed via a four-wheel drive dirt road that leads over the mountains from the Big Smoky Valley to the Monitor Valley. To reach the cave, travel about 14 miles east of Austin on U.S. 50 to the point where it intersects with State Route 376 (the road to Tonopah). Turn south on 376, then after about a tenth of a mile, take an immediate left onto a dirt road (marked by an historical marker for Toquima Cave). Continue for about 15 miles across the valley and head into the mountains. At a place known as Pete’s Summit, you’ll reach the Toquima Caves Campground (it is marked with large forest service signs). Park near the campgrounds, then hike about a quarter of a mile on a marked trail to the cave. Of course, the cave is difficult to reach at this time of year, so plan your visit during the summer or fall months. The hike to the cave winds through a forest of scruffy piñon trees. The trail gradually climbs to a large red colored rock outcropping, where the cave is located. You’ll know you’ve found it when you spot the tall, metal fence across the mouth of the cave. To protect the cave, an imposing 10-foot-high cyclone-style fence blocks access. Unfortunately, the National Forest Service doesn’t have the resources to staff the area around the clock so the fence helps keep vandals out. Despite the fence, it is possible to look into the cave to see the pictographs. As someone who had never seen these kind of markings, I found myself fascinated by the various shapes and colors. Painted all over the rock walls inside the cave where strange round shapes as well as various types of squiggly and straight lines. I was most impressed by the colors. I had been expecting black charcoal markings but saw drawings painted in bright red, yellow, white and black. As I stared at the painted symbols, they began to take on familiar forms. A couple of lines and circles became a stick figure of a deer or elk. Another cluster of lines seemed to look like an elephant—although elephants never lived in Nevada—or maybe it was a bison. The sheer number of pictographs surprised me—there seemed to be dozens drawn all over the cave walls. In my mind, I began to speculate about what they meant. Maybe they told stories or passed on some kind of information from one generation to the next. Perhaps they were just cave graffiti or represented some kind of record-keeping system. And I wondered why they came to such an out-of-the-way place to just scribble on the walls. We’ll probably never know for sure. I turned away from the fence and looked back over the surrounding landscape. The view of the valley and the trees was spectacular. Then it hit me. Maybe those ancient people came to the cave simply because it was a cool place to hang out. It seemed like as good a reason as any. The Toquima Cave Campground is open from May to November. It has only six sites; two with picnic tables. One of the sites has a fire pit with a grill while the others have fire rings. There is a unisex toilet near the campground but no water or garbage facilities, so you’ll have to bring any food and water you’ll need (and pack all your garbage out with you). For more information about Toquima Cave contact the USDA Forest Service, Tonopah Ranger District, www.fs.fed.us/htnf/tonopah.htm. Sometimes it can be worthwhile to revisit a place where you’ve been before. That was the case when I recently stopped at the Hickison Summit area off U.S. 50, located about 25 miles east of Austin. I’d been to Hickison Summit, which is a Bureau of Land Management rest area, on several previous occasions. But on this particular visit, I was able to spend a little more time at the site and discovered that I had only seen a portion of what is found there. The site is located about a mile off the highway via a graded dirt road. At first glance, it appears to be little more than a couple of picnic tables tucked into a forest of bushy piñon pine trees enclosed in a canyon. However, if you walk along the marked, interpretive trail, you quickly find that this is a site rich with ancient petroglyphs, which are prehistoric rock carvings. On my earlier stops, I had seen a handful of the stone etchings along a sandstone cliff directly southwest of the parking lot. 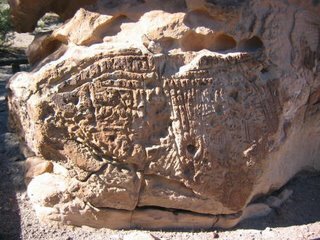 This time, I studied the rock walls more closely and discovered dozens more horseshoe-shaped carvings as well as various squiggles, circles and patterns etched into the stone. While the exact meaning of these carvings isn’t known, many archaeologists believe that the Hickison Summit glyphs represented fertility. Additionally, in some places, the symbols seem to suggest the seasons and elements, particularly the sun. The trail leads to the opposite side of the canyon, where, if you look closely at the walls, you can find additional rock symbols carved high in the stone (look up). During my previous visits, I had also not noticed that there are petroglyphs carved into several large stone boulders near the picnic area. These include writing that resembles some kind of multiple-legged creature as well as intricate grid-style patterns. In addition to the rock art, the Hickison Summit site in the Simpson Park Mountains, also features exceptional scenery (perhaps that's what really attracted those early people who carved the petroglyphs). A short trail leads to the top of a rise behind the canyon and a scenic overview spot that offers a great view of the surrounding area. As a Bureau of Land Management recreational area, the Hickison Summit site also includes restrooms and a half dozen, day use picnic tables. For those wanting to camp (in the warmer months), check out the Bob Scott Campground, located about 15 miles west of Hickison Summit on Highway 50 (10 miles east of Austin). This Forest Service area includes 15 campsites in piñon trees as well as picnic tables and drinking water. There is a fee for overnight camping. For more information about the Hickison Summit area and other central Nevada attractions contact the Bureau of Land Management, Battle Mountain District Office, 50 Bastian Rd., Battle Mountain, NV 89820, 775-635-4000. 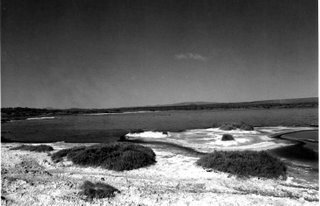 While Soda Lake near Fallon may look like a typical desert lake, there is much more to its story. Not truly a natural body of water, Soda Lake was created by several factors, including the presence of natural springs, a rising water table caused by irrigation of the area and the effects of mining its depths for soda, which started in the 1850s. In fact, in recent years the lake's historic significance has some folks talking about designating the lake as a park or putting it on the National Register of Historic Places. Soda Lake is located about 55 miles east of Carson City via Highway 50 and Soda Lake Road, a marked paved street that is five miles west of Fallon. Geologically speaking, the Soda Lake basin was created by a collapsed volcanic cone. The outline of the cone can best be seen on the east side of the lake, which rises high above the water. Additionally, rock hounds can find plenty of stones that are volcanic in origin on the ground around the lake. In the 1840s, pioneers crossing the nearby 40-mile desert stumbled upon the lake as well as the natural springs adjacent to it, which were the first fresh water to be found after crossing that dreaded stretch of desolate landscape. In the mid-1850s, several claims were filed on the lake because of the presence of extremely pure soda, which could be used in the mining operations on Virginia City's Comstock Lode. Starting in 1875, commercial soda extraction operations commenced on the lake and two major soda works were constructed on the edge of the lake, making it one of the west's first commercially viable soda producing areas. Records indicate that soda from the lake was of such quality that it won a gold medal at the 1876 Centennial exposition in Philadelphia. Ironically, the completion of the Newlands Water Project in 1915, which helped spur the development of the surrounding Lahontan Valley as an agricultural and ranching oasis, marked the beginning of the end of Soda Lake's namesake business. Irrigation water from the massive aqueduct system, which brought water to the desert valley from the Carson and Truckee rivers, percolated into the groundwater and caused the lake level to rise. Within a few years, the soda plant was submerged, an occurrence that resulted in several lawsuits, including a landmark legal decision, which stated that the U.S. Government could be absolved from damages as a result of "unintentional" actions committed by one of its agencies. In the end, the lake level rose from 147 feet to more than 200 feet, leaving the soda works under some 35 feet of water. As a result of being under water, the soda works structures have remained well preserved. Over the years, the lake has become popular with divers who can swim through the relatively intact ruins of the old soda plant and other buildings. Additionally, divers report the presence of a "ghost forest" at the southeastern end of the lake, which is believed to be the remains of a grove of cottonwood trees. Photos of the soda works and trees are on display at the nearby Churchill County Museum in Fallon and depict a mysterious, murky underwater world filled with strange shapes and shadows. Because of its undeveloped nature—submerged soda factory notwithstanding—the lake has become a sanctuary for a wide variety of birds. Visitors can often spot flocks of gulls, terns, ducks and other waterfowl enjoying the peace and calm of this half-hidden lake. The lake also boasts a population of brine shrimp and underwater plants that have adapted to the high alkali content of the water. For more information about Soda Lake, contact the Churchill County Museum, 1050 S. Maine St., Fallon, NV 89406, 775-423-3677, www.ccmuseum.org. The longer you stay in Nevada, the more you begin to see its beauty. Out beyond the cities and towns are dozens of natural areas boasting unique geological features, rare plants and animals, and other intriguing qualities. Indeed, there are few experiences as rewarding as venturing into the vast Nevada landscape to discover a place that hardly anyone have ever seen. 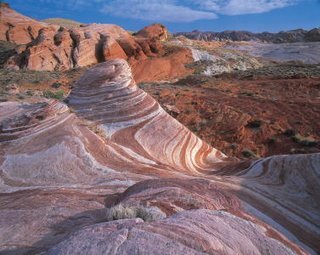 The following are four of Nevada’s less well-known scenic treasures. 1. Lexington Arch, Great Basin National Park—Great Basin National Park has so many extraordinary features such as, Lehman Caves, Wheeler Peak, ancient bristlecone pines, and a glacier, that Lexington Arch, located near the park’s southeastern boundary, often is overlooked. It shouldn’t be. Lexington Arch is an impressive, 75-foot-high limestone bridge. The arch is considered unusual because most other arches in the West are carved from sandstone. Experts suggest that Lexington Arch may once have been part of a cave, the rest of the rock having worn away. They point to the presence at its base of flowstone, a smooth rock usually found in caves. Other geologists theorize that the arch is a natural bridge carved by the waters of Lexington Creek. 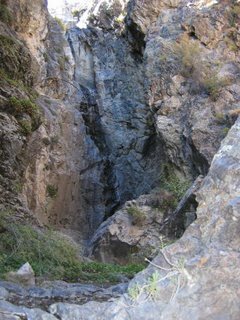 Long ago, when the walls of Lexington Canyon were not so steep, the creek may have flowed through a cave in the wall of the canyon and, over time, eroded the tunnel into a large arch. 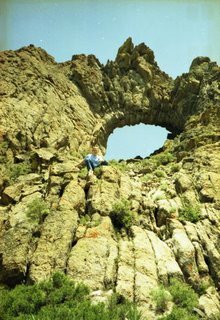 Regardless of its origins, Lexington Arch is an imposing landmark that, despite its obvious attributes, is one of the least-known places in Great Basin National Park. One reason for the lack of visitors is its remote location. To reach the arch from the park’s visitor center, drive east to Baker for five miles and turn right on Nevada State Route 487. Drive south 10.7 miles (you’ll pass into Utah, then back into Nevada). Continue through Garrison, Utah, to Pruess Lake. Take the first dirt road on the right just south of Pruess Lake. Proceed 12 miles on the dirt road (there will be signs leading to the arch) to a small parking area. A moderately steep hiking trail leads 1.7 miles to Lexington Arch. 2. White Domes, Valley of Fire State Park—While the Valley of Fire is pretty well known, the White Domes Area is one of the state park’s least visited spots. Located at the north end of the park, which is 50 miles northeast of Las Vegas, White Domes is a field of white sandstone ridges, slot canyons, and outcroppings that don’t appear to be of this world. With white-chocolate-smooth rock faces and stone ripples, White Domes seems to have been poured into place rather than forged by geological forces. This part of Nevada sat beneath an inland sea until about 150 million years ago. Over time, thick layers of mud and sand on the lake’s bottom were transformed into limestone and sandstone, which, eventually were sculpted into interesting shapes by rain and wind. The park’s distinctive red sandstone is the result of oxidized iron that permeated the rock. At White Domes, however, the iron has leached out in places, producing white sandstone that starkly contrasts with the surrounding red rock. Traveling on the gravel White Domes Road, an 11-mile roundtrip from the park’s visitor center, you can view tilted mountains vividly banded with red and white sandstone and admire the two namesake domes. A picnic area at road’s end serves as the trailhead for a half-mile hike into Kaolin Wash, where water has carved a steep, winding gash through the rock. Stone ruins found about a quarter-mile from the picnic area are remnants of the set of The Professionals, a 1966 Western that starred Lee Marvin, Burt Lancaster, and White Domes. 3. Kershaw-Ryan State Park—It’s too bad that few people outside Lincoln County know about Kershaw-Ryan State Park, a spring-fed oasis that is one of Nevada’s most beautiful parks. Located two miles south of Caliente, the park honors Samuel and Hannah Kershaw, who homesteaded the canyon (named Kershaw Canyon) in the 1870s. The abundant water in the box canyon permitted the Kershaws to plant fruit trees, grapes, and other crops. In 1904, the Kershaws sold their ranch holdings to James Ryan of Caliente. In 1926, the Ryan family donated the verdant canyon, known as Kershaw Gardens, to the state as a public park. Nine years later, it became one of Nevada’s first state parks. Flash floods in 1984 destroyed the park’s facilities and roads, but it was reopened in 1997. Kershaw-Ryan remains one of the state’s most scenic—and least visited—parks. The steep cliffs of Kershaw Canyon, carved by water erosion, are striped with layers of red sandstone and gray-green limestone. The park supports four plant communities, ranging from riparian (cottonwood, willow, and reeds) on the cooler, wetter canyon floor to piñon-and-juniper woodland at higher elevations. Visitors can sometimes view larger animals in the park—attracted by the presence of water and plants—including deer, coyotes, and mountain lions. The park also serves as a refuge for migrating birds. The Canyon Overlook Trail offers views of the surrounding cliffs, Horsespring Trail, and Rattlesnake Canyon Trail. Often, you’ll have the trail to yourself. 4. Joshua Trees, Delamar Valley—About 10 miles southeast of Caliente on U.S. 93 is the invisible line separating the Great Basin from the Mojave Desert. A clue that you’ve crossed this boundary is the appearance of Joshua trees, spiky, thick-limbed desert plants that flourish in the Southwestern desert. Mormon pioneers named the trees after the biblical figure Joshua because the uplifted branches reminded them of Joshua praying and pointing to the Promised Land. You first encounter the Joshua trees at the point where U.S. 93 drops into the Delamar Valley, about 12 miles east of Caliente. First you notice a solitary Joshua in a field of sagebrush and junipers. Then you see another. Soon you’re driving through a veritable forest of Joshua trees. If you pull off the road for a closer look, you’ll notice how large they are—Joshuas can grow more than 30 feet high. Long, knife-like leaves grow from the branches, which sprout randomly. The trees look less like plants and more like deadly weapons. Naturalists note that the Delamar Joshua trees are somewhat unusual because they grow beyond the northern limit of creosote bush, one of the indicators of the margins of the Mojave Desert. Some scientists believe that the moderate local climate and the presence of water have allowed the Delamar trees to flourish where they’re not supposed to be. Located on the edge of the Black Rock Desert, about two-and-a-half hours north of Carson City, is Fly Geyser, one of those unexpected things you sometimes find in Nevada. Continuously spewing clouds of hot water about four or five feet high in the air, Fly Geyser is a remarkable sight when you first spot it from the nearby highway. 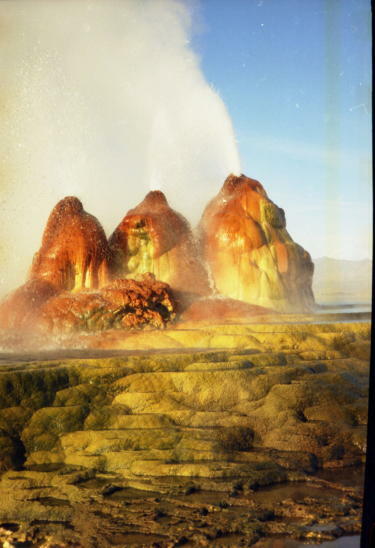 The geyser, located on the Fly Ranch, consists of three, large travertine mounds, with a series of terraces around its base. In addition to the spraying hot water, the most impressive thing about the trio of tufa rock cones is their colors—rich, vivid shades of green and rust. The geyser, which is about 20 miles north of Gerlach via State Route 34, is located on private property but you can see the water plumes from the road. Adjacent is a small geothermal pond, fed by run off from the geyser. Perhaps the most interesting detail about Fly Geyser is the fact that it’s not really a natural phenomenon. The geyser was created accidentally in 1964, after a geothermal power company drilled a test well at the site. While the groundwater in the region turned out not to be sufficiently hot to be tapped for geothermal power, it did have a temperature of more than 200 degrees. According to later newspaper reports, the well was either left uncapped or was improperly plugged. In either case, the scalding hot water was allowed to shoot from the well hole and calcium carbonate deposits began to form, growing several inches each year. Jump forward several decades, and those deposits have become large mounds taller than an average-sized man that rise out of a field of tall reeds and grasses. Scientists familiar with the geyser note that the green and reddish coloring on the outside of the mounds is the result of thermophilic algae, which flourishes in moist, hot environments. Interestingly, the set of circumstances that created Fly Geyser in 1964 apparently occurred at least one time before. In about 1917, a well was drilled a few hundred feet north of the geyser. This well was also abandoned and, over time, a massive 10 to 12-foot calcium carbonate cone formed. Today, no hot water flows from the older mound—a photo of which appeared on the cover of a late 1940s issue of Nevada Magazine. It is almost as if the earlier geyser dried up when water was diverted to the newer one. Despite Fly Geyser’s uniqueness, there are no current plans to convert it to a public park or preserve. While it has been discussed over the years, nothing yet has come of those proposals. The million-acre Black Rock Desert area that surrounds Fly Geyser is an extremely active geothermal zone. For instance, the tiny hamlet of Gerlach is home to several natural hot springs. Some, such as Great Boiling Spring, which is a mile north of the town, have been developed (although not open at the present time). About three miles north of Gerlach on SR 34 you can find a small field of geothermal vents and springs adjacent to the road (on the left side). Here, boiling hot water bubbles from a hole in the ground and spills down a steaming ditch. It’s natural, open to the public, and undeveloped—which makes it a unique little attraction. The town of Gerlach was established in 1909 as a station on the main line of the Western Pacific Railroad. It was named for the Gerlach Land and Cattle Company, part of the large Gerlach and Waltz Ranch, which was founded in the late 19th century by Louis Gerlach. It is also home of Bruno's Country Club, a roadside diner that serves up some of the largest and roundest (and tastiest) ravioli you’ll ever find as well as a good-size hamburger with home fries. Nearby Empire is a company town (largely owned by U.S. Gypsum, a dry-wall manufacturer) that boasts a nine-hole, par-three golf course, which is in the center of the town.